Karla Lara on Tour in the U.S.
Karla Lara is a p olitical activist, singer/songwriter, and women’s rights advocate from Honduras. She tells the story of many women, and it is her intention for women to see reflections of themselves in her work. Her music portrays the tension between the harsh realities that women face and the hope and persistence required to fight for human rights. She began singing in 1985 with the Choir of the National Autonomous University of Honduras and with the musical group “Rascaniguas.” In 1988 she left Honduras to join the musical group “Cutumay Camones” from El Salvador, a musical group that was very important in the revolutionary music scene during the war of liberation in El Salvador. Karla is part of the National Network of Human Rights Defenders in Honduras and has been a prominent voice in the Honduran Resistance Movement that arose in opposition to the 2009 military coup d’état. Karla returned to Honduras in 2002, but continues to travel the world performing and raising awareness for social justice issues in Honduras and beyond. The information about Karla Lara is from the Student Organization for Latin American Students at the University of New Mexico – one of the groups hosting Karla. 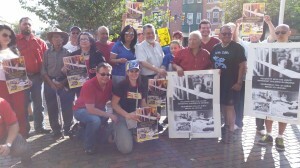 Solidarity Action for Chabelo ! The Honduras Solidarity Network is asking for your solidarity with Chabelo and the campesino movement in Honduras with an email and phone campaign from Mon 9/1 – Wed 9/3 to demand from The Supreme Court of Honduras that his conviction and sentence be annulled and Chabelo be freed immediately. Email and phone scripts are below the summary. Even if you don’t feel comfortable calling in Spanish you can still send emails!! QUANTITY IS KEY!! Jose Isabel “Chabelo” Morales Lopez, 38, is a campesino (peasant farmer). His family is a part of Honduras’ agricultural communities in the Aguán Valley. They live in the heart of the African palm-producing region of the northern coast. He has been in prison for 6 years, and is sentenced to 17.5 years more, for a crime that he did not commit. His arrest and imprisonment are aimed at punishing and criminalizing the campesino movement in Honduras as well as a product of the well-documented corruption and impunity that has Honduras in its grip. This has contributed to its being one of the poorest countries in the region and one of the most violent in the world. Chabelo is recognized as being unjustly imprisoned by numerous human rights and rural advocacy groups inside and outside of Honduras such as, Via Campesina; SOAWatch; FIAN International; the Committee of the Families of the Disappeared and Detained (COFADEH); and the Jesuit institution ERIC-SJ. We are aiming to saturate the Supreme Court with communications on 2 specific targeted dates: Monday September 1st and Wednesday August 3rd. This way the message will be loud and clear that the international community is united in demanding the immediate freedom of Chabelo Morales. Subject: Jose Isabel Morales Lopez. Le escribo desde______________ (your country and organization, if applicable) para expresar mi preocupación en el caso de José Isabel Morales López. Ante de todos, quiero reconocer la decisión alentadora de los magistrados en el año pasado para anular la sentencia de Señor Morales López. Sr. Morales ha estado buscando la justicia por 6 años, y esta decisión ha sido la primera y unica luz en el largo túnel de la injusticia. La Sala Penal ordenó un nuevo juicio, que comenzó a finales de enero de 2014. El juicio se vio ensombrecida por la mala conducta de la fiscalía por parte del Ministerio Público de Trujillo y el fiscal Jose Reynaldo Canales. Además, los magistrados del Tribunal aceptaron el testimonio perjuro de Henry Osorto, Subcomisionado de la Policía Nacional. Debido a estos graves violaciónes de la justicia, yo estoy exigiendo que la Corte Suprema, una vez más se anule la sentencia y la condena de José Isabel Morales y que sea liberado de inmediato de la cárcel. Y no mas juicios! Les pido que aquellos de ustedes en la Sala Penal haz todo lo que puedas para acelerar el proceso. El retraso de la justicia es una negación de los derechos del Sr. Morales. 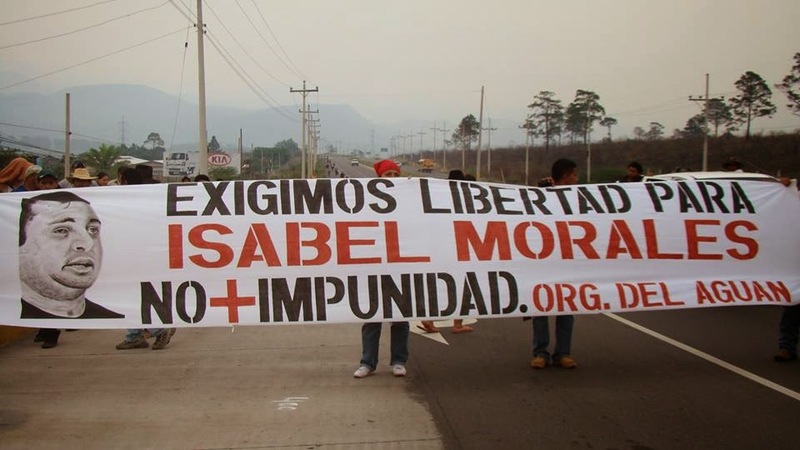 La comunidad internacional va a seguir el caso de José Isabel Morales y espero escuchar pronto de su libertad. I am writing from______________ (your country and organization, if applicable) to express my concern in the case of Jose Isabel Morales Lopez. First of all, I want to acknowledge the encouraging decision of the judges last year that annulled the judgment of Mr Morales López. Mr. Morales has been seeking justice for 6 years, and this decision has been the first and only light in the long tunnel of injustice. The Criminal Court ordered a new trial, which began in late January 2014. The trial was marred by the misconduct of the prosecution by the Public Ministry and the prosecutor Jose Reynaldo Canales. In addition, the judges of the Court accepted the perjured testimony of Henry Osorto, Sub-commissioner of the National Police. Because of these serious violations of justice, I am demanding that the Supreme Court, once again annul the conviction and sentence of Jose Isabel Morales and that he be released from prison immediately. And no more trials! I ask that those of you in the Criminal Division do everything you can to expedite the process. Delayed justice is a denial of the rights of Mr. Morales. The international community will follow the case of Jose Isabel Morales and look forward to hearing your freedom. Hola, soy (your name) y estoy llamando de (your country and organization, if applicable). En primer lugar, Quiero reconocer la importancia de la decisión de los magistrados en el año pasada para anular la sentencia de José Isabel Morales López. La Sala Penal ordenó un nuevo juicio, que comenzó a finales de enero de 2014. El juicio se vio ensombrecida por la mala conducta de la fiscalía Jose Reynaldo Canales. Además, el Tribunal aceptaron el testimonio perjuro de Henry Osorto, Subcomisianado de la Policía Nacional. Debido a las violaciónes graves de la justicia por parte del Tribunal, estoy exigiendo que el Corte Supremo, una vez más anula la sentencia y la condena de José Isabel Morales y que sea liberado de la cárcel inmediatamente. Y no mas juicios! La comunidad internacional va a seguir el caso de José Isabel Morales y espero escuchar pronto de la resolución de su caso y su libertad. El retraso de la justicia es una negación de los derechos del Sr. Morales. Gracias. 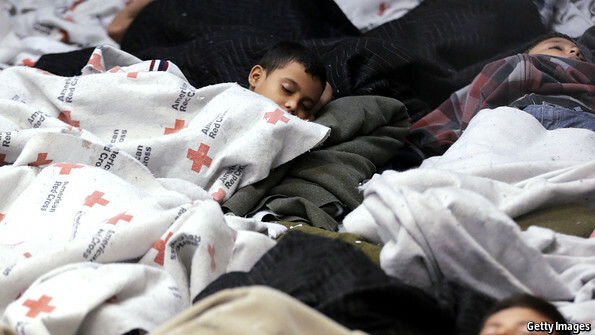 TELL PRESIDENT OBAMA: DON’T DEPORT THE CHILD REFUGEES! July 14, 2014: The Honduras Solidarity Network, a network of over 30 US solidarity organizations, and Department 19, a network of Hondurans living in the US and Canada, members of the FNRP/LIBRE Party, are appalled and saddened by the refugee crisis on the US border. Children fleeing military and police, drug cartel, corporate violence and extreme poverty in Central America, to reunite with family members in the United States, cannot and must not be viewed through a nativist lens as illegal aliens, but rather as the refugees that they are. We are ashamed that the response of our political class and the Obama administration to this crisis is to call for yet more militarization of the border and quicker deportation processes with a complete lack of acknowledgement of the responsibility of the US government for creating this crisis over both the long and short term. The problem of the child refugees is in part blowback from US policy in the 1980s when our government trained and funded Salvadoran and Guatemalan military and police to prevent popular revolutions, and more recently when the US supported the coup against President Manuel Zelaya in Honduras. US foreign policy, anchored in the militarized Drug War and pursued by both the Democratic and Republican administrations, has only empowered brutal and corrupt armies and police forces, particularly in Honduras and Guatemala. US so-called free trade and structural adjustment policies have required the countries of Central America and Mexico to cut social services and credit to small farmers while wiping out local producers with a flood of low-cost, US taxpayer-subsidized products from US agribusiness. These policies have increased poverty and desperation in Central America and Mexico and created a fertile recruiting ground for drug cartels and criminal gangs. The Obama administration bears particular responsibility for the influx of refugees from Honduras. The US turned a blind eye to the military coup of June 28, 2009 which overthrew the democratically elected government. After a brief suspension of aid, the Obama administration devoted its full diplomatic weight to return Honduras, under its coup-spawned government, to the OAS and UN despite opposition from most countries in Latin America. US Ambassador Lisa Kubiske was quick to recognize current defacto President Juan Orlando Hernandez’ election last November while credible complaints of massive fraud were still coming in. The Obama Administration has spent millions of dollars since the coup to equip and train Honduras’ murderous and corrupt military and police with the result that massacres of small farmers and political assassinations of reporters, Libre Party activists, human rights defenders, indigenous, labor, women, campesinos and LGBTI activists have skyrocketed. We are especially saddened and incensed that President Obama’s $3.7 billion request to Congress for emergency funds to deal with the refugee crisis contains almost $2 billion for more incarceration and removal of minors and refugees, without regard to their due process rights or the root causes of their desperate flight from their home countries. Indeed, in order to speed their deportation, he has called for suspending a 2008 law which requires minors to be transferred out of detention to centers where they can locate family members to care for them. Thoroughly revise our trade and economic, drug and military policies so that they respect the right of self-determination of the peoples of Central America and Mexico to create alternatives to displacement and migration with living wage jobs, prosperous communities and accountable and democratic governments. 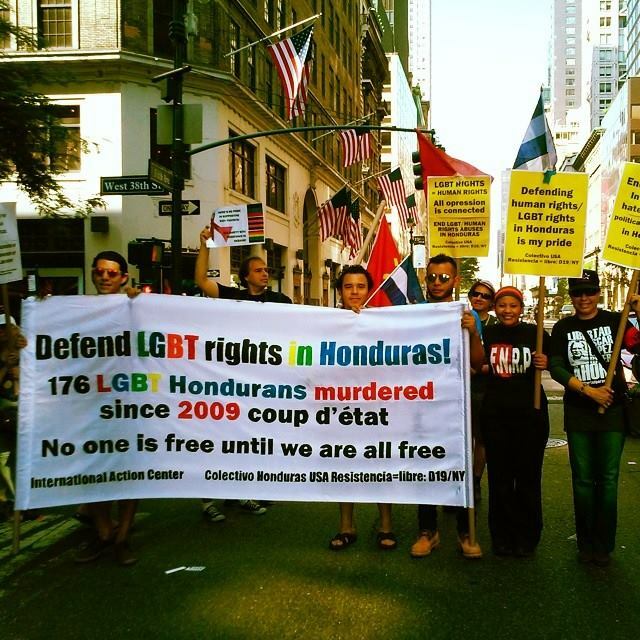 HSN member organizations organized actions and participated in Pride Week activities to commemorate 5 years of resistance and violence in Honduras. 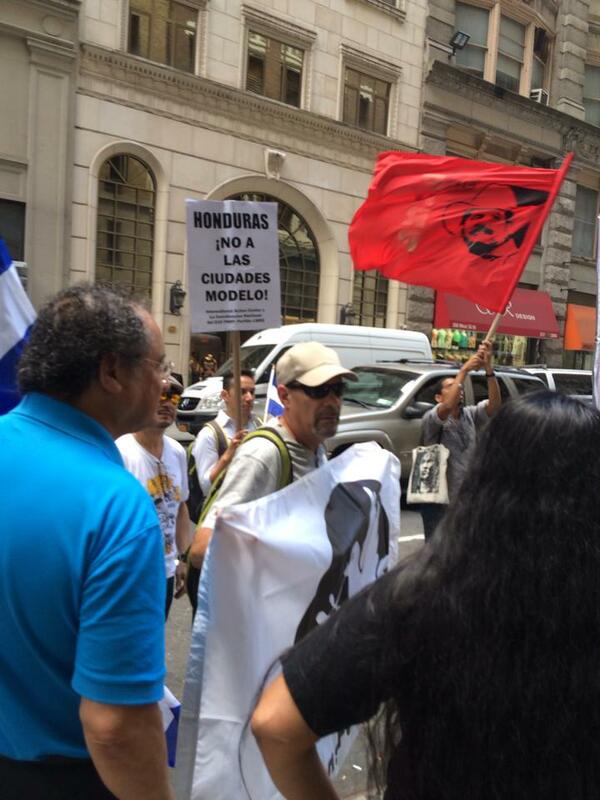 June 27, 2014 the Colectivo Honduras USA Resistencia (D19) together with International Action Center (both members of the Honduras Solidarity Network) organized a protest in front of the Honduran Consulate in New York for the 5th anniversary of the coup d’e’tat in Honduras against President Manuel Zelaya Rosales and the Honduran people. From Honduras, Nelson Arambú, a member of the Diversity Movement in Resistence from Honduras participated and presented during the activities. 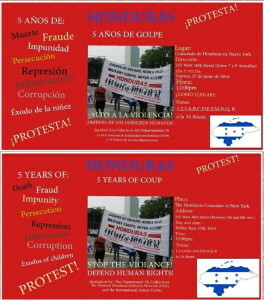 Este pasado viernes, 27 junio de 2014, el Colectivo Honduras USA Resistencia (D19) junto al Centro de Acción Internacional (Ambos miembros de la RED Nacional de Solidaridad con Honduras) realizamos un plantón frente al Consulado de Honduras en Nueva York, con motivo del quinto aniversario del golpe de Estado en Honduras, perpetrado contra el Presidente Manuel Zelaya Rosales y el pueblo hondureño. Tambien contaron con la participacion de Nelson Arambú del Movimiento de Diversidad en Resistencia quien esta en gira en EEUU. 28 de junio, a cinco años del Golpe de estado en Honduras; Como ya lo hemos venido haciendo en años anteriores, este año nuevamente vestimos de rojo la Placita del municipio de Chelsea, Massachusetts. Contamos con una presencia nutrida de miembros, simpatizantes de libre y representantes de la solidaridad que siempre han caminado con nosotros los resistentes hondureños organizado en los EEUU. June 28th, 5 years since the coup d’e’tat in Honduras, as we have done in past years, this year we again, covered the Plaza of Chelsea, Massachusetts with red. We had the participation of members of the D19 Colectivo de Libre in Boston,sympathizers of LIBRE and representatives of solidarity groups that have always walked with us – Hondurans resisting, organized in the USA. 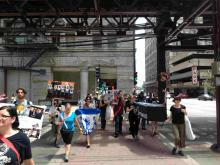 Members of the Honduras Solidarity Network ( La Voz de los de Abajo, CRLN, 8th Day Center for Justice) worked to organize a procession/protest in downtown Chicago. We were joined by Gay Liberation Network, Radios Populares, US El Salvador Sister Cities (Cinquera-Chicago), and more solidarity activists. 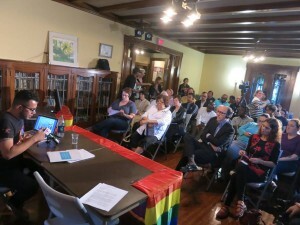 Chicago HSN groups also participated in the immigrant rights contingent in the Gay Pride parade and with Gay Liberation Network hosted Nelson Arambú of Honduras’ Diversity Movement in Resistance for a public meeting on July 2. 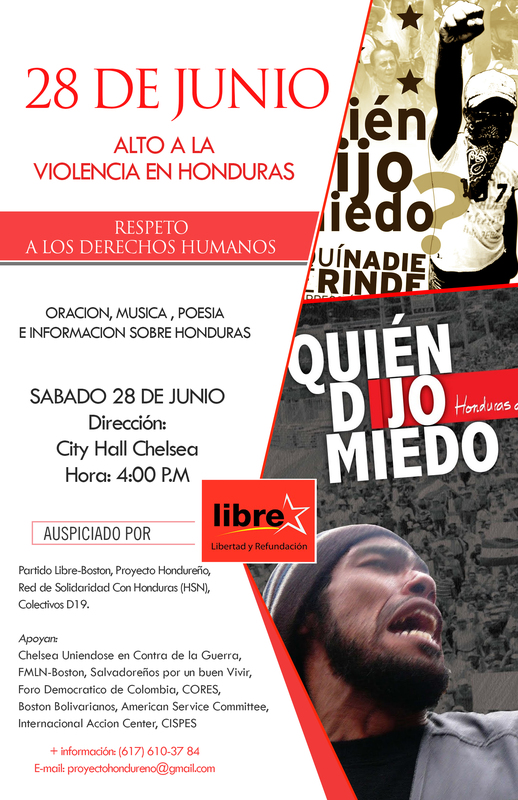 Los inmigrantes hondureños/as residentes en EEUU-CANADA organizados en Colectivos del FNRP/Partido Libre y la RED de Solidaridad con Honduras, este 28 de junio de 2014, quinto aniversario del golpe de Estado en Honduras, reafirmamos nuestro compromiso de seguir luchando de la mano de nuestros/as hermanos/as hondureños/as por los cambios fundamentales, urgentes y necesarios que requiere la sociedad hondureña. Este 28 de junio también rendimos homenaje a los mártires hombres y mujeres valientes, que han ofrendado su vida por defender el derecho a ser un pueblo libre, soberano y socialista. Estamos aquí para decirle a la oligarquía sanguinaria, que Morazán camina con el pueblo hondureño y que el país será liberado. Desde el fatídico golpe de Estado del 2009, el sufrimiento del pueblo Hondureño se ha agudizado, por las permanentes violaciones a los derechos humanos, asesinatos, represión estatal, éxodo masivo de migración (incluido niños/as), robo del erario público e impunidad. Honduras encabeza la lista de los países más violentos del mundo en donde 22 ciudadanos/as hondureños/as son asesinados/as cada 24 horas. Miles de hondureños han abandonado el país en busca de mejores horizontes, huyendo de la violencia y las condiciones inhumanas de vida, aun arriesgándose a morir o quedar mutilados en la travesía por el tren conocido como La Bestia. Según estadísticas públicas, desde el año 2013, Honduras es el país de Centro América con mayor número de migrantes y tristemente también es el país con mayor número de deportados desde los Estados Unidos. Este 28 de junio, condenamos los asesinatos cometidos contra dirigentes y miembros del FNRP/Partido Libre y la sociedad hondureña en general y los atropellos por parte del ejército y la policía militar contra los Diputados del Congreso Nacional de Honduras el pasado 13 de mayo. Exhortamos a la Resistencia Nacional conformada por todos los sectores de la sociedad hondureña (sindicatos, campesinos, mujeres, juventud, estudiantes, profesionales, comunidad LGBT, grupos originarios, organizaciones defensoras de derechos humanos, grupos sociales, garífunas, partidos políticos, inmigrantes, intelectuales y medios de comunicación) a cerrar filas y luchar unidos frente al aprendiz de dictador, Juan Orlando Hernández, títere de la oligarquía asesina hondureña y los grupos de poder confabulados con la derecha internacional. Responsabilizamos al régimen fraudulento actual (continuador del golpe de Estado) por la violencia generalizada, corrupción e impunidad que vive el país, demandamos un alto a la violación de los derechos humanos y exigimos justicia para las víctimas y castigo a los culpables. Como residentes de los Estados Unidos y Canadá, condenamos las políticas de los gobiernos que en el pasado han apoyado y en el presente continúan apoyando a la dictadura en Honduras y que, junto con las empresas de esos países imponen sus agendas antipopulares y anti-medio ambientales con la violencia y la corrupción. Apoyamos el derecho del pueblo hondureño a luchar contra la represión y el abuso y nos solidarizamos con sus organizaciones. We Honduran immigrants, residents in USA-CANADA organized in Collectives of the FNRP / LIBRE Party, and we, members of the Honduras Solidarity Network in the US and Canada on this June 28, 2014, the fifth anniversary of the military coup in Honduras, reaffirm our commitment to continue fighting, hand in hand with our brothers and sisters in Honduras who struggle for the fundamental, urgent and necessary changes in Honduran society. This June 28 we also pay tribute to the martyrs of the resistance, brave men and women, who have offered their lives to defend the right to be a free, sovereign and socialist county. We are here to tell the bloody oligarchy of Honduras, that Morazán walks with the Honduran people and that the country will be liberated. 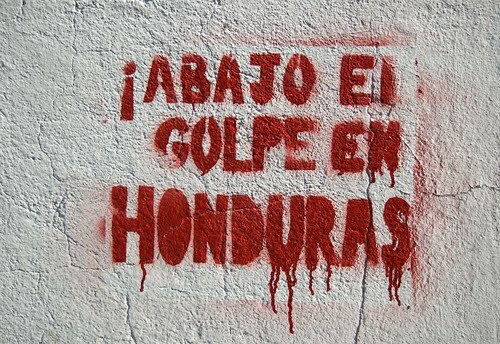 Since the brutal military coup of 2009, the suffering of the Honduran people has been exacerbated by the continuing violations of human rights, killings, state repression, mass exodus of migration (including children), theft of public funds and impunity. Honduras tops the list of the most violent countries in the world where 22 Honduran citizens are murdered every 24 hours. Thousands of Hondurans have left the country in search of better opportunities, fleeing violence and inhumane living conditions, even at the risk of being killed or being mutilated by the train known as The Beast in the crossing. According to public statistics, since 2013, Honduras is the Central American country with the highest numbers of migrants and sadly also the country with the largest number of deportees from the United States. This June 28, we condemn the murders of leaders and members of FNRP / LIBRE Party, the social movements and Honduran society in general and the abuses by the army and military police against the Congressmen and Women at the National Congress of Honduras on May 13. We urge the National Resistance, formed by all sectors of Honduran society (unions, peasants, women, youth, students, LGBT Community, indigenous groups, Human Rights Defense organizations, Social groups, Garífuna, political parties, immigrants, intellectuals and media) to close ranks and fight together against the want-to-be dictatorship of Juan Orlando Hernández, puppet of the Honduran assassin oligarchy and international power groups conjoined with the international right. We hold the current fraudulent regime (a continuation of the military coup) accountable for the widespread violence in the country; we demand an end to the violations of human rights, justice for the victims and punishment for the guilty. 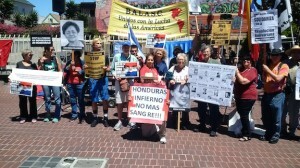 As residents of the United States and Canada we condemn the policies of those governments that have in the past and continue in the present to support the dictatorship in Honduras and which, along with corporations from those countries impose their anti-people and anti-environment agendas with violence and corruption. We support the right of the Honduran people to struggle against oppression and abuse and we stand in solidarity with them and with their organizations. We resist and we shall overcome! HSN members are organizing and participating in actions for the anniversary of the coup on June 28th in Boston, Chicago, New York, Washington DC, Milwaukee, St. Louis and the San Francisco Bay Area. More info below. Join La Voz de los de Abajo in participating in the Gay Liberation Network’s Pride Parade contingent on refugee and immigrant rights. We will be highlighting the violence agains the LGBT community and activists in Honduras. 11 am. sharp meet at the Target Store (4466 North Broadway). 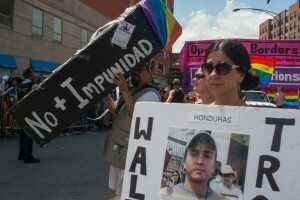 Saint Louis, Missouri: The Honduras Task Force of the Inter-Faith Committee on Latin America in St. Louis will be marching in the the Pride Parade in St. Louis on Sunday, June 29th, carrying posters of our martyred compañeros y compañeras en Honduras and signs about the coup. At the IFCLA’s annual dinner that evening, there will be a presentation about the situation in Honduras and Honduras will be represented at a local weekly peace vigil on a busy street corner in the city and speak about the anniversary and current situation. Five years ago, on June 28, 2009, graduates of the School of the Americas overthrew the democratically-elected government of Honduras. In a well-planned operation, 200 masked soldiers under the command of SOA graduate General Romeo Vásquez Velásquez stormed the presidential palace in the middle of the night. The soldiers grabbed President Zelaya from his bed, forced him onto an airplane and flew him into exile. The state television was taken off the air. Electricity to the capital, Tegucigalpa, was cut, as were telephone lines and cell phone service.The leadership of SOA graduates in the coup follows a pattern of anti-democratic actions by graduates of the school (renamed Western Hemisphere Institute for Security Cooperation, WHINSEC), a U.S. military training facility for Latin American soldiers. The past five years have been marred by violent repression against the Honduran social movements, continued U.S. aid and training for the abusive Honduran security forces, fraudulent elections that kept the coup supporters in power, and the torture and murder of members of the opposition. Despite the violence, campesinos, indigenous groups, environmentalists, LGBTI communities, feminists, students, and human rights activists are mobilizing for justice, dignity and self-determination. We will stand in solidarity with the Resistance in Honduras, commemorate all the victims of torture by keeping vigil, celebrate life, remember lost friends and family, and renew our commitment to a world where peace rules and torture is forever banned. On May 26th community leader, Irene Meza was killed In San Francisco de Opalaca where election fraud in November installed a ruling party (National Party) mayor who was not accepted by the town; the indigenous council then led a takeover of the municipality. A National Party gunman opened fire on Mr. Meza and also wounded another activist. National Party thugs then attacked the car taking Mr. Meza and the other wounded man to the hospital. The night of May 24th In Rio Blanco, where the community and its indigenous council have been blocking the construction of a hydroelectric project,community activist William Jacobo Rodríguez was murdered. There were also new incidents of threats, detentions, and beatings by the police of community members. Below is the recent communique on both incidents from the Lenca organizations, COPINH with the demands of the communities. CALLS OR LETTERS ARE NEEDED: The situation in both communities is very insecure and at high risk for more violence against the community members and political opposition. Please contact the US Embassy Human Rights Officer and/or the Attorney General (Fiscal General) of Honduras to express your concern and demand an end to the state sponsored violence, serious investigations of the acts of violence and murders, and an end to the political persecution of COPINH, LIBRE and the indigenous councils in the communities. In Spanish: Oscar Fernando Chinchilla, Fiscal General de la República. Yesterday, after the conclusion of an important Indigenous Assembly in San Francisco de Opalaca – the purpose of which was to socialize the findings of the Audit demanded by the Lenca people and carried out by the Superior Accounting Tribunal as well as to make decisions in the context of the construction of the Indigenous Government – employees of the ex-Mayor that the National Party has tried to impose appeared in a private vehicle and Mr. Hugo Sánchez, without saying a word, took out a pistol and fired on Irene Meza and Plutarco Bonilla. Irene Meza is the husband of the 3rd Councilwoman of the Legitimate Mayor’s Office, Ada Elizabeth Méndez, who was in charge of reading the Audit report in the Assembly yesterday. Plutarco Bonilla is a well-known compañero in the struggle against the coup d’etat, in the resistance movement, and both are part of the LIBRE party. Additionally, both compañeros had been participating in all of this most recent struggle in San Francisco Opalaca. The brutality with which this crime was perpetrated is so extreme that when Irene Meza, shot with bullets in the stomach and chest, was being driven to the hospital in La Esperanza by his wife and a driver, they were attacked again by a heavily armed group of men at the height of the ascent of the Zarco River, causing the vehicle to crash. The armed men then proceeded to the site of the crash, shooting 6 more shots at Irene. In this crime, the two people with him were also injured. With regards to Plutarco Bonilla, we inform that a bullet hit his hand and he is out of danger. On the other hand, in Río Blanco, between Saturday May 24th and Sunday May 25th, while he was returning to his home around midnight, William Jacobo Rodríguez, a struggler in defense of the Gualcarque River against the imposition of the Agua Zarca Hydoelectric Dam, was murdered. 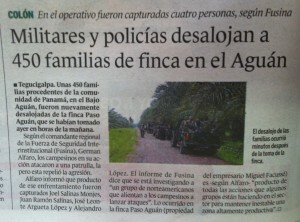 It is worth mentioning that even though somebody already confessed to this crime, the Police forces that are stationed at the DESA installation in Rio Blanco as part of a special operation against the Lenca People, proceeded to break into homes and arbitrarily capture two COPINH members, Lindolfo Benítez and Salvador Sánchez, and as if that were not enough, they then physically and emotionally tortured both of them, threatened to kill minors that were in their houses, and also threatened and verbally attacked Francisco Javier Sánchez, President of the Indigenous Council of Rio Blanco and Coordinator of Land and Territories for COPINH. -Effective investigation and immediate application of justice for the murders of William Rodríguez and Irene Meza as well as the attempts against Plutarco Bonilla, Ada Méndez and Pedro Rodríguez. 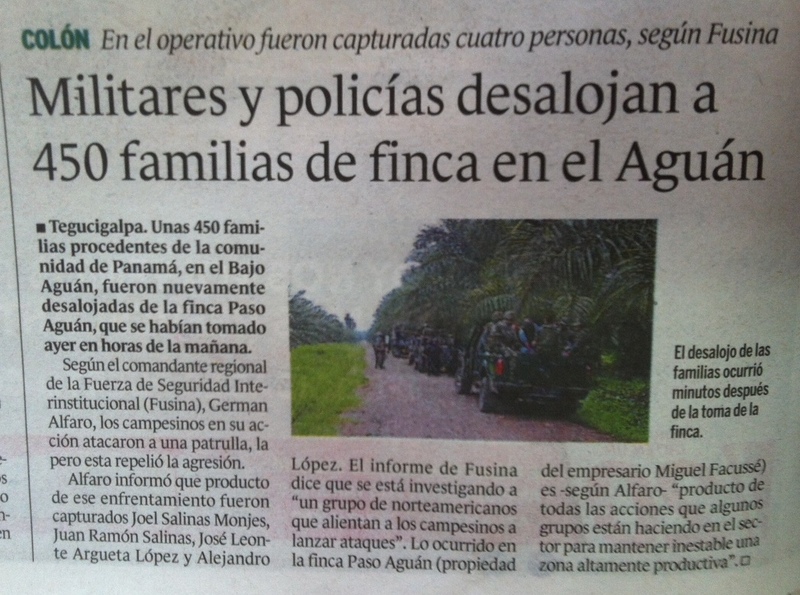 -Although Lindolfo Benítez and Salvador Sánchez, in the early hours of today were taken back to Rio Blanco and freed, we demand an investigation and punishment of the repressive forces responsable for their torture and abitrarity, for which COPINH has repeatedly demanded the withdrawal of this police force that only has brought threats and repression to the communities that constantly reject it. -An end to the political repression and criminalization against the Lenca people and COPINH, against the social and political strugglers. COPINH holds responsible the State of Honduras, President Juan Orlando Hernández, the powerful groups, corporations, as well as the army and police, for all the polices of terror and criminalization against our People and organization. We declare that all the actions of Indigenous people rising up and defending territory and the common goods of nature, against large predatory capital, for the construction of self-determination, for ILO Convention 169 and Indigenous government continue strong; this will be part of the big Assembly for Territory and Communities that will start tomorrow, May 27 and the 5-department Regional Mobilization in La Esperanza, Intibucá on Thursday, May 29 at 10.00am, all of our actions guided with hope for our ancestral history of rebellion and dignity. In Intibucá, May 26, 2014. ¡In the face of more repression, more struggle and organization! ¡We are sons and daughters of Lempira! Witness for Peace Southwest has published the following action alert and updates for the Honduras Solidarity Network http://wfpsw.org. There are three sections. 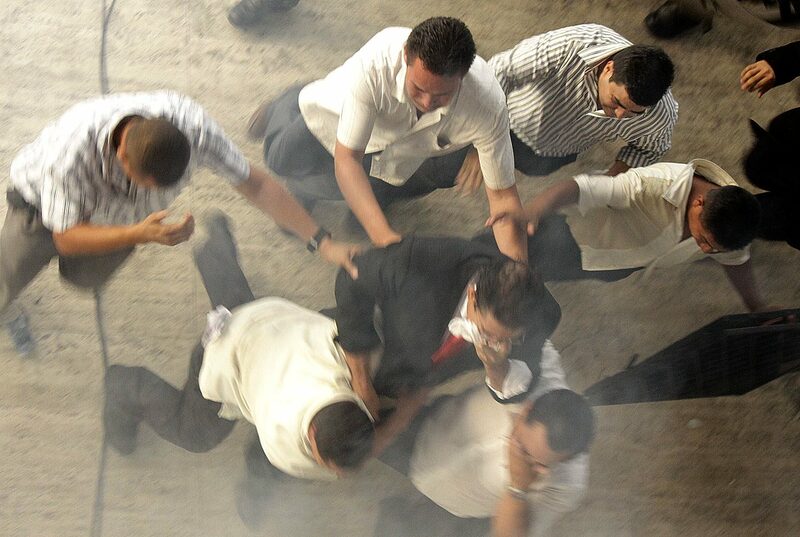 Honduran LIBRE congress members brutalized and teargassed by military police inside congressional building. Congressional Dear Colleague Letter on Honduras now with 67 signers. Has your Rep. Signed? Calls and emails needed to the State Department and US Embassy in Honduras demanding the US denounce the violent treatment of Honduran congress members at the hands of the Honduran Military Police. Video here of military police repressing congresspersons inside and outside congressional building. Video of two women LIBRE congesspersons overrun and trampled by military police. The President of the National Congress, Maurico Oliva, gave the order to brutally repress the opposition party Libertad y Refundación (LIBRE) and the activists and leaders that were demonstrating peacefully below the National Congress. The order of the day was repression and violence, said the congressmembers from LIBRE. The violent actions led by agents of the State left several congressmembers hospitalized and dozens of demonstrators with serious blows/injuries, produced by the brutality with which riot troops and military police acted. 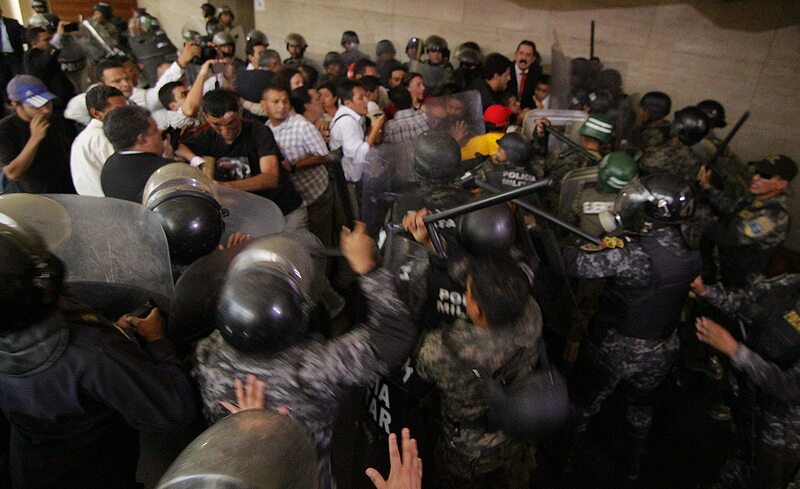 Around 4:00 in the afternoon a strong contingent of military police, police from the Special Operations Command (COBRA), and military troops entered into the hall of sessions of the National Congress, occupied strategic positions inside the big hall, surrounded the congressmembers of LIBRE and began to use batons, tear gas bombs, and shields to assault, push and mistreat and beat the representatives of the people. 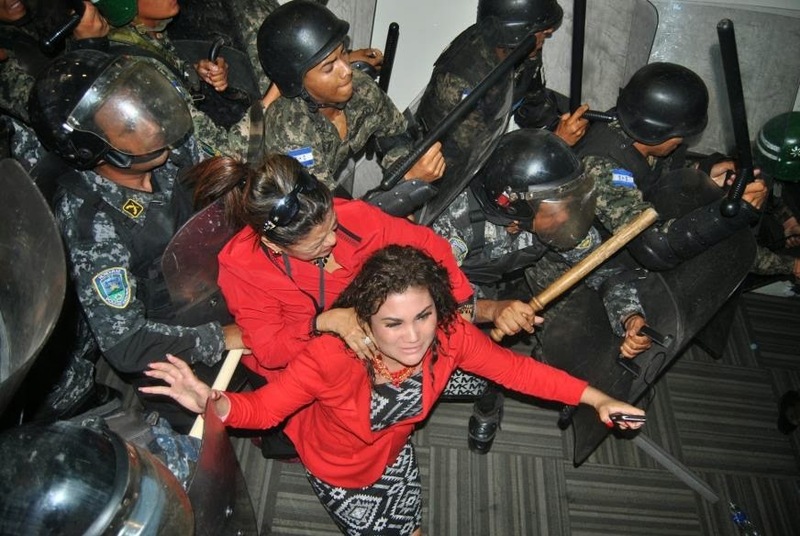 There was no consideration for anyone, including congressmembers such as Claudia Garmendia, congressmember from the department of El Paraíso, who suffered the charge of the military soldiers, in which she was surrounded on the floor, and rescued by one of her congressmember companions. In the streets of the historic center you could breath smoke and pepper gas in industrial quantities, and while people covered their mouths with scarves, others were persecuted and beaten by those in uniform. The central park was once again the scene of battle between demonstrators and police, but in disproportionate conditions. Many of the protesters were persecuted and beaten by those in uniform. Congressmember Claudia Garmendia was hospitalized because of the blows and gases she received inside the hall of sessions of the National Congress; also the congressmembers Elvia Argentina Erazo (Copán) and Audelia Rodríguez (Atlántida). Congressmembers Hari Dixon, Rafael Alegría, and Wilfredo Paz were beaten. The Red Cross transfered several disheartened and injured people to the Hospital Escuela. Several days ago LIBRE called for a peaceful demonstration underneath the National Congress [Transl: the building is sort of on big stilts, with an open area on the first floor; the actual congress is on the second floor], demanding that, because LIBRE is the second political force in the country, with 36 congressmembers, it be represented in the Supreme Electoral Tribunal. The demand was met by a response from the President of Congress Mauricio Oliva that LIBRE had to obtain 86 congressmembers in order to be included. And the other response from Oliva was made this afternoon, in ordering a brutal repression against the opposition politicians, activists, and leaders of LIBRE. The situation is worrisome to human rights bodies, considering tomorrow environmentalists will arrive at the National congress tomorrow to demand an end to concessions for extraction of the country’s mineral resources. The Honduras Solidarity Network has set up an emergency fund for Hondurans who need emergency medical help, relocation for security reasons and for the families and victims of human rights abuses and assassinations. Please support the Honduras Emergency Fund if you are able. 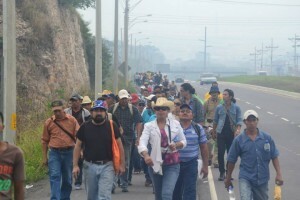 Campesinos, Indigenous peoples and members of the social movements launch a “caminata” march across the country with demands for “Dignity and Sovereignty”. For the complete communique, demands and list of organizers s click here. Funds still needed for food, housing, transport and medical support for the dozens of organizations participating in the “caminata”. Donate here to the caminata. The Mobilization began on Wednesday, May 14th in the morning, leaving from the community of Zambrano. Arrival in Tegucigalpa is planned for Thursday the 15th and we call for participation from the Popular Resistance; FNRP Collectives; Base Organizations of the Social and popular urban movement, artists, writers, feminists, Youth, Leftist Political Organizations; LGBT Organizations and all the organizations that are in the struggle against the oppressor system and the continuation of the Coup d’E’tat of 2009, organizations in struggle against neoliberal policies, imperialism and the patriarchy. It is important to count on the solidarity of the citizenry in general, to bring water, basic grains (beans, rice, etc.) fuit, vegetables, mattresses, blankets and medicines for during the march and especially for the indefinite vigil that we will maintain beginning May 15 in the plaza below the National Congress. Liberty for Jose Isabel Morales Chabelo Now! For an Integral Agraria Reform: Raise the Banners of Struggle! Mining and Hydroelectric Projects: Out of Honduras! Sovereignty YES! ZEDE or Charter Cities NO! Justice! Justice! Justice!…Stop Stop the Femicides! Honduras Dear Colleague letter now with 67 signers! Has your Rep. Signed? Rep. Shakowsky’s Dear Colleague letter on human rights in Honduras now has 67 signers. See the list to see if your Rep. Has signed on yet. Click here to send a letter thanking your Rep for signing on. If you Rep has not signed click HERE to send a letter asking them to sign on by the letter’s deadline Wed May 21st. For a full text of the Letter click Here. Click HERE to Thank Your Rep or Ask your Rep to sign the Shakowsky Honduras Letter. 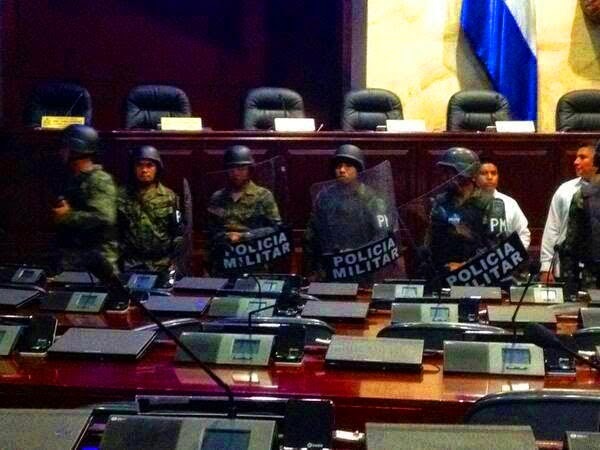 On May 13th military police under orders from the President of the Honduran National Congress attacked LIBRE Party members of Congress inside the congressional chambers with tear gas and batons sending several to the hospital, then the special tactical group of National Police (COBRAS) attacked the multitude of protesters from the National Front of Peoples Resistance and other social justice organizations who were outside the congress building. The LIBRE congress members were peacefully protesting inside Congress about the lack of basic parlimentary rights allowed to the opposition in Congress. More than 300 people from social justice, resistance, campesino and indigenous groups started the mobilization that will arrive in Tegucigalpa May 15th for protests on May 16th. 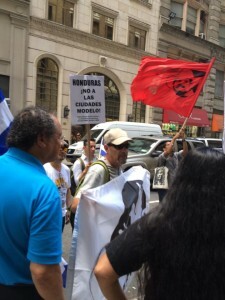 We are mobilizing to demand the immediate liberty of our political prisoner compañero, José Isabel Morales, “Chabelo”, whose complete right to prove his innocence has been violated, unjustly condemned to 17.5 years in prison, because of the power of political interests, in complete violation of his rights as a citizen and of the Constitution of the Republic. We are mobilizing to demand the derogation of the Law that puts into effect the Special Development and Employment Zones (ZEDE) or what is called Charter Cities, and we demand the resolution of the suit challenging its constitutionality in the Supreme Court of Justice by representatives of organizations from the Social and popular movement. We are mobilizing to demand the investigation of the femicides at the national level by the State and the punishment of those who, protected by the impunity that prevails in the Justice system, continue to commit barbaric acts. More than three months after the takeover of City Hall in San Francisco de Opalaca, COPINH demands that the State of Honduras respect the process of the Indigenous Lenca Government of San Francisco de Opalaca, respect the Indigenous and legitimate Mayorship, for its ancestral and historic authority, unrestricted respect for its self-determination, territories and natural goods. We demand the official removal of the Imposed Mayor. The Mobilization will begin on Wednesday, May 14th in the morning, leaving from the community of Zambrano. Arrival in Tegucigalpa is planned for Thursday the 15th and we call for participation from the Popular Resistance; FNRP Collectives; Base Organizations of the Social and popular urban movement, artists, writers, feminists, Youth, Leftist Political Organizations; LGBT Organizations and all the organizations that are in the struggle against the oppressor system and the continuation of the Coup d’E’tat of 2009, organizations in struggle against neoliberal policies, imperialism and the patriarchy.